Amazing condition, the exterior of the bag is in perfect condition, the interior flap shows very minor surface marks, shown in image 10. Beautiful Tom Ford for Gucci chain bag with metallic purple and studs details. Vintage Gucci signature classic "GG" monogram crossbody handbag. 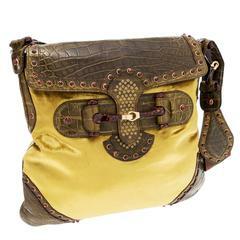 Shoulder strap and zippered top with brass charm zipper pull . Made in Italy.